Mashed potatoes and gravy, Grandma’s famous chocolate pie, and other favorites can be a joyous part of any celebration. We all know that Thanksgiving and Christmas are fast approaching, which means food, food, and more food. The holidays are often filled with time-honored traditions that include some of our favorite meals and food. In order to feel your best, it is important to remember to eat in moderation and stay active. Try these three quick tips that will ensure you will enjoy your favorite foods in moderation and also stay active. The first tip to ensuring you will enjoy your favorite foods in moderation are to enjoy all the food groups at your celebration. It is important to share healthier options during your holiday meal. 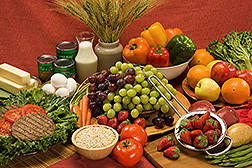 Try to include your leafy green vegetables, lean meat, low-fat casseroles, and add fresh fruit to the dessert table. This will guarantee you are off to a good start while celebrating your favorite holidays. The second tip is to make exercise a part of the fun of the holiday season. During your celebrations, make being active part of your holiday tradition. You can have a fun walk and talk with your family and friends after a holiday meal. For the Christmas season, you can give gifts that encourage others to practice healthy habits such as workout DVDs, running shoes, and reusable water bottles. These gifts are a perfect start to making exercise a part of your fun filled holiday season. The last tip is to tweak your sweets. We all develop a sweet tooth during the holidays. In order to tweak that sweet tooth, try to make healthier sweets for your family and friends to enjoy. For dessert, try baked apples with cinnamon and a sprinkle of sugar instead of apple pie. You can also invite your guests to make their own parfait with colorful sliced fruits and low-fat yogurt. Using these three tips will help ensure you will enjoy your favorite foods in moderation and stay active during the holiday season. Remember when it comes to holidays, eat in moderation and take small steps to stay active. For more information about how to choose healthy foods and stay active during the holidays, please contact Kyndle Nichols at the Extension office at 252-789-4370. • Are You a Landowner Interested in Working With Beginning Meat Producers? We Need You!